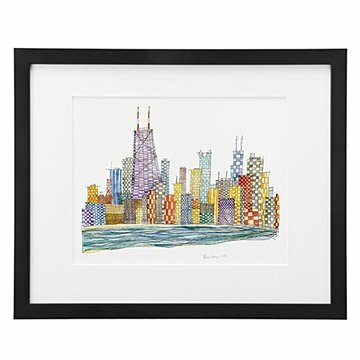 This cityscape was inspired by Renee Leone's hometown, Chicago. Home Sweet Home, Blizzard, and Summer in the City, are homages to Renée's hometown: Chicago. The three images were painted from North Avenue Beach and Lake Shore Drive, conceived while spending countless hours along the Chicago Lakefront 18 mile path. Renée feels the Chicago Lakefront is her "home away from home," having had taken the train into the City as a kid with her father to visit the "big" beaches, and later in adult life with daily trips to "Leone Park and Beach" named after her great uncle, Sam Leone who was a boat captain. The family beach was only a couple of blocks away from home and the lakefront a place for frequent training for triathlons, jogging, walking, swimming, and rollerblading. To Renée, the shores of Lake Michigan are a part of her being and inspired her love of expansive horizons and scenic vistas. Hung at the front door. Very interesting, vibrant colors. This was the perfect birthday gift for my daughter who recently moved to CA. It is a colorful reminder/keepsake of her hometown.